Royal Burgundy is very closely related to the popular Kanzan flowering cherry, and shares its gardener-friendly characteristics and profuse deep pink blossom. However as the name suggests, Royal Burgundy differs in one important respect from Kanzan, its leaves are an intense deep bronze colour (turning scarlet in the autumn). 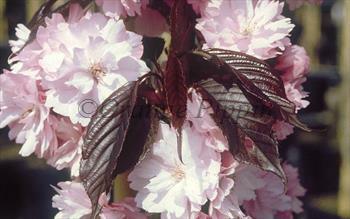 Please fill in the details below and we will let you know when Royal Burgundy flowering cherry trees are back in stock.